For centuries exquisite Islamic floral and geometric patterns have decorated sacred illuminated manuscripts and Islamic texts. This workshop gives an introduction to the principles of Islamic Geometric patterns and biomorphic designs based on proportion, balance and harmony. 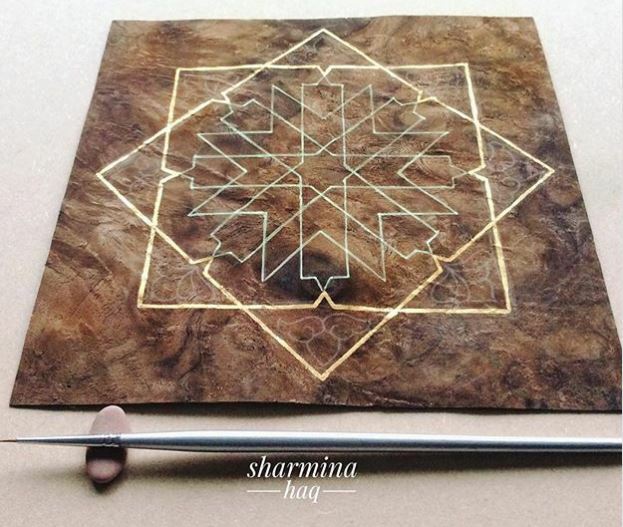 Participants will learn to construct traditional patterns based on 4 and 8 fold symmetry inspired by ancient sacred manuscripts and architecture from the Islamic world, using Euclidean tools of a compass and straight edge. Gilding techniques with 23ct transfer and handmade gold paint. Materials are not included in your course fee. Some materials will be provided by the tutor. The approximate cost of these will be £5 payable to the tutor during the course.